Amazon has taken the wraps off a new entry-level Kindle – and it’s super affordable without compromising on features. Previously, the entry-level Kindle did not have any kind of light built in, so you had to have a light source to read by – now you don’t need a light, because it’s on the device. For that alone, it may well be the best Kindle for people on a budget. The only big feature it’s missing is water resistance, so if you like to read in or near water, you’ll want to pay more for the Kindle Paperwhite. 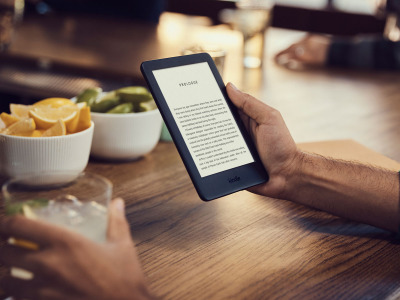 The new Kindle boasts a new e-ink touchscreen with better contrast and a resolution of 167 pixels-per-inch. It’s a glare-free display, too, so it should look nice and natural when you’re reading outside or in a bright environment. If it’s night time or you’re in a dark environment with no light source, the built-in front light has you covered, too. The new Kindle has 4GB of storage to hold thousands of ebooks, though it is half the amount of storage you’d get with the Kindle Paperwhite. You don’t have to stick with written books, either. With Audible, you can listen to audiobooks on your Kindle via Bluetooth headphones or a speaker. You don’t have to worry about running out of battery any time soon, either, as it lasts weeks at a time. So as long as you charge the Kindle every now and then, you shouldn’t ever really run out of juice. Using Audible and Bluetooth audio will drain the battery faster, though. Of course, perhaps the best thing about the Kindle ecosystem is how many millions of books are available in Amazon’s massive ebook library. Plus, if you use our handy guide on how to use a Kindle, you can learn how to get free ebooks, deals on ebooks, and more expert tips and tricks.